We celebrate our 65th Independence Day this year. It is a great day in the life of any nation, and is no different for us in India. The struggle for independence under the leadership of Mahatma Gandhi has been very arduous, and British rulers in India had created all possible difficulties and troubles. However, Gandhi’s satyagraha was so peaceful and based on non-violence and human values that he got support from all corners of the world including the citizens of England! India’s struggle had a touch of magic, adventure and romance, too. Truth, righteous conduct, peace and non-violence were Gandhi ji's invincible weapons. In India, an ancient land of sages and seers, it is well known that 'Love as thought is truth, love as action is righteous conduct, love as feeling is peace and love as understanding is non-violence (Satya Sai Baba). The wave of patriotism swept across the nation, and 1915 to 1947 was the golden period. The freedom fighters, writers, thinkers, poets, scientists, teachers in schools and professors in the universities, the farmers and people from every walk of life rose to the occasion. The British government found it just impossible to suppress this non-violent movement. Had it been violent, the mighty British government would have quelled in no time! And at midnight of August 15, 1947 India’s Tricolour went up the air signaling a new independent nation, ‘where the mind is without fear, and head was held high’ with dignity and pride. Freedom is priceless and its value can only be realized in its absence. We in India while celebrating our Independence Day should remember the sacrifices of our people and struggle they had gone through to achieve this. 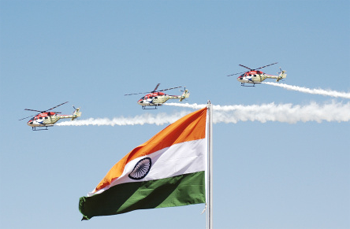 We are today fortunate to breathe the air of free India. There is freedom of speech, and we are free to express our views. Over the past 65 years we have travelled far in fields of science and technology, specially information, space and nuclear technology, creating excellent medical facilities only in some metros, reasonably good roads, and in many more sectors. However, we lag in some critical areas – sanitation, literacy and medical facilities in rural India. However, the most hurting aspect in free India is corruption at higher places, specially among the policy makers. This is not a good sign. We need to fight a fresh battle, once again peacefully, against the corrupt to raise our prestige and economy among the comity of nations. This Independence Day is special, for we shall congratulate the medal winners in just completed London Olympics 2012!